Our free motorcycle installment sale can be used when the seller accepts payment terms when selling a motorcycle. Note: The sample motorcycle installment sale on this page is for multiple payments and makes provision for your document to be notarized. Before compiling your installment sale agreement, you need to verify what the permissible interest rates and penalty rates upon default are in your jurisdiction. Free Motorcycle Bill of Sale - for use with a single payment. Lien Release - upon full and final settlement, to be issued to the buyer of your motorcycle. For guidelines and additional information on recording a lien, permissible interest rates and defaulting on an agreement visit this Bill of Sale page. You may choose not to record a lien on the motorcycle when doing an installment sale, although that carries a risk should the buyer go bankrupt. Our Promissory Note page has more information on unsecured loans. Interest Charges: Interest shall accrue at the rate of _____percent(_____%) per year on any unpaid balance. Late Payment Fees: An additional late payment fee in the amount of $_______ (________________dollars)shall be payable by the Buyer if payment is not made within _____days as stipulated in the payment terms. The Buyer will pay to the Seller ______payments of $________ (_____________________dollars) each at consecutive monthly intervals on the ________day of each month, starting on the ___________day of ___________________20____ until the Outstanding Balance and accrued interest is paid in full. All payments shall first be applied to outstanding late payment fees, then to accrued interest and thereafter to the Outstanding Balance. The Buyer may prepay the Outstanding Balance in full or in part at any time without premium or penalty. All prepayments shall first be applied to outstanding late payment fees, then to accrued interest and thereafter to the Outstanding Balance. Payment in terms of this motorcycle installment sale agreement shall be made at the above stated address of the Seller or at such place as may be designated from time to time in writing by the Seller or assignee of this agreement, or as mutually agreed by the parties. If the Buyer fails to make any payment when due for whatever reason and the Seller provides notice of such failure, the Buyer must effect payment of the amount due within ____ days, failing which the Seller can demand immediate payment of the entire outstanding balance and accrued interest. In the event of default this motorcycle installment sale agreement may be turned over for collection and the Buyer agrees to pay all reasonable legal fees, collection and enforcement charges to the extent permissible by law, in addition to other amounts due. The Seller guarantees that he/she is the true and lawful owner of the above described motorcycle and that it is free of all encumbrances and any and all legal claims. The Seller warrants that at the date of signature of this motorcycle installment agreement there are no licensing fees or fines or other penalties outstanding against the registration of the motorcycle sold in terms of this agreement. The Seller or his/her agent gives no warranty or guarantee other than those specified in 8. 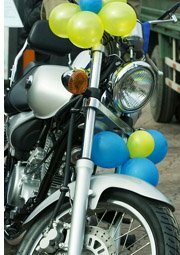 The motorcycle is sold "As-Is" and the seller shall not be liable for any defects, patent, latent or otherwise. The Buyer admits to having inspected the motorcycle to his/her satisfaction and that no guarantees or warranties of any nature were expressed or implied by the Seller or his/her agent regarding its condition or quality. 12.1 A lien shall be recorded on the title of the motorcycle and the Seller shall retain a perfected security interest in the motorcycle until all installment payments and all other amounts under this agreement have been paid in full. 12.2 The Buyer shall effect at his/her cost the filing of a financing statement at the relevant public offices within 5 (five) days of signing this agreement and shall furnish proof of such filing to the Seller. 12.3 The Seller shall issue a lien release within 5 (five) days of receiving full and final payment of all monies due under this agreement, where after the onus shall be on the Buyer to file the lien release with the relevant public offices. The Buyer shall be liable for all costs relating to the registration of the motorcycle into his/her name and all costs relating to the Roadworthy Certificate. 14.1 The Risk passes to the Buyer once the Buyer or his/her agent receives the keys to the motorcycle or takes possession of the motorcycle. 14.2 Loss of or damage to the motorcycle will not release the Buyer from his/her obligations under the terms of this agreement. 14.3 The Buyer shall insure the motorcycle against all risks with a recognized insurance company acceptable to the Seller at his/her cost. The Buyer shall furnish proof of such an insurance policy to the Seller and assign to the Seller all rights to receive proceeds of insurance to the value of the Outstanding Balance. 14.4 The Buyer shall effect all maintenance and repairs to the motorcycle at his/her cost where necessary in order to keep it in the condition at which it was sold and any improvements to or accessories placed on the motorcycle shall become inherent components thereof. 14.5 The Buyer will keep the motorcycle free from any other liens or security interests and will promptly pay all statutory fees. 14.6 The Buyer agrees not to sell, dispose of or transfer the rights to the motorcycle to another party without the prior written consent of the Seller until such time as all monies have been paid under this agreement. 15.2 The Seller may assign this motorcycle installment sale and security agreement to a third party without notice to the Buyer and the Buyer agrees to remain bound to any subsequent holder of this agreement under the terms of this agreement. 16.1 Upon default by the Buyer under the terms of this agreement and within 3 (three) days of demand by the Seller, the Buyer shall deliver the motorcycle to the Seller, failing which the Seller my enter any premises where the motorcycle is being held with or without legal process and take possession of the motorcycle. 16.2 The Seller shall then have the right to sell the motorcycle in any manner which he/she may deem fit and to apply the proceeds to the repayment of monies due under the agreement. 16.3 The Buyer agrees that proceeds from the sale of the motorcycle shall first be applied to repayment of monies due under the agreement and that any surplus money shall be transferred to the Buyer. 16.4 The Buyer agrees that he/she shall remain liable for any shortfall if the proceeds from the sale of the motorcycle are not sufficient to repay all monies due under the agreement. Should there be more than one signatory to this motorcycle installment sale and security agreement, their obligations shall be joint and several and each specifically agree to be bound by all the provisions as set out in this agreement. No relaxation, indulgence, waiver, release or concession of any terms of this agreement by the Seller on one occasion shall be binding unless in writing and if granted shall not be applicable to any other or future occasion. This agreement shall be binding upon and accrue to the benefit of the parties, their successors, legal representatives and assigns. Should any provision of this agreement be judged by an appropriate court of law as invalid, it shall not affect any of the remaining provisions whatsoever.